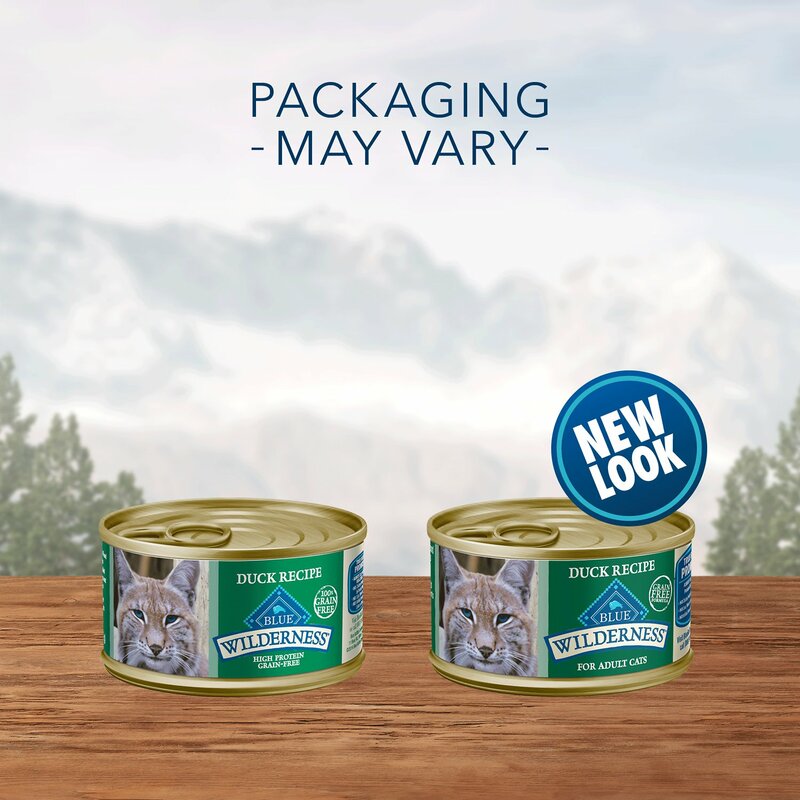 Feed your kitty’s wild side with the high-protein nutrition of Blue Buffalo Wilderness Duck Grain-Free Canned Cat Food. 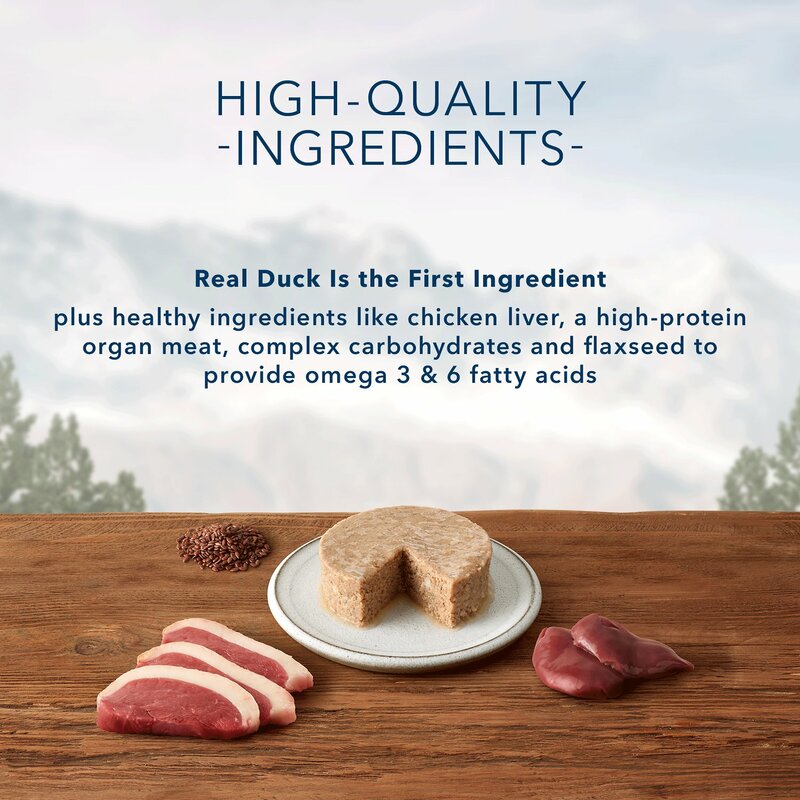 Made with real duck as the first ingredient and never any grains, wheat or by-products, it packs a powerful protein punch to support your little hunter’s overall health and satisfy his meat cravings with every bowl. 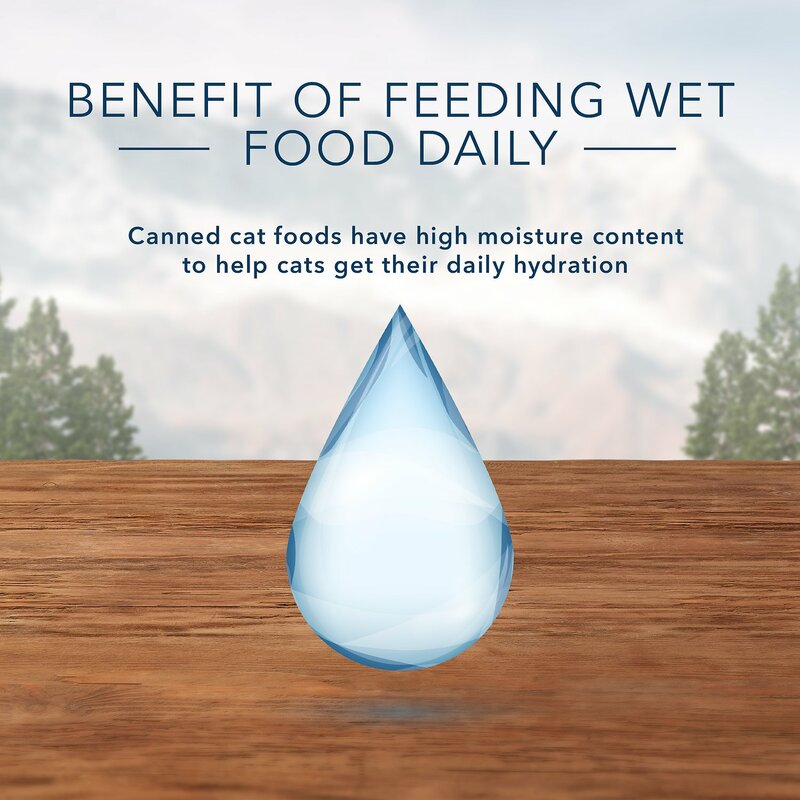 It’s also loaded with vitamins, minerals, omegas, and essential amino acids for a complete, well-rounded diet for cats of all ages. Plus, it provides a high amount of moisture to keep your pal hydrated and healthy, and has zero artificial flavors or preservatives. Grain-free recipe starts with protein-rich duck as the first ingredient to support lean muscles and satisfy a carnivorous appetite. 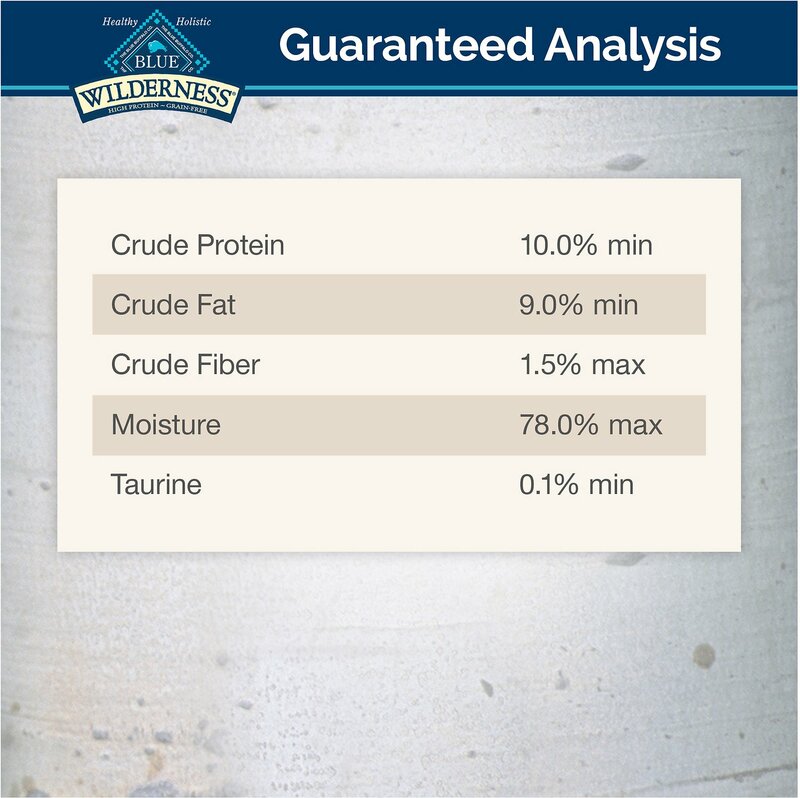 Provides a balanced and complete diet for cats of all ages, with no artificial flavors or preservatives. 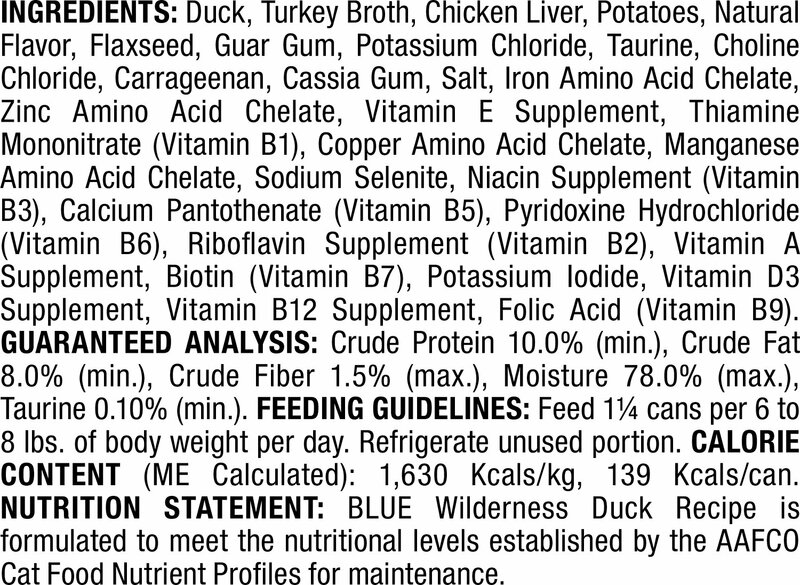 Duck, Turkey Broth, Chicken Liver, Potatoes, Natural Flavor, Flaxseed, Guar Gum, Potassium Chloride, Taurine, Choline Chloride, Carrageenan, Cassia Gum, Salt, Iron Amino Acid Chelate, Zinc Amino Acid Chelate, Vitamin E Supplement, Thiamine Mononitrate (Vitamin B1), Copper Amino Acid Chelate, Manganese Amino Acid Chelate, Sodium Selenite, Niacin Supplement (Vitamin B3), Calcium Pantothenate (Vitamin B5), Pyridoxine Hydrochloride (Vitamin B6), Riboflavin Supplement (Vitamin B2), Vitamin A Supplement, Biotin (Vitamin B7), Potassium Iodide, Vitamin D3 Supplement, Vitamin B12 Supplement, Folic Acid (Vitamin B9). 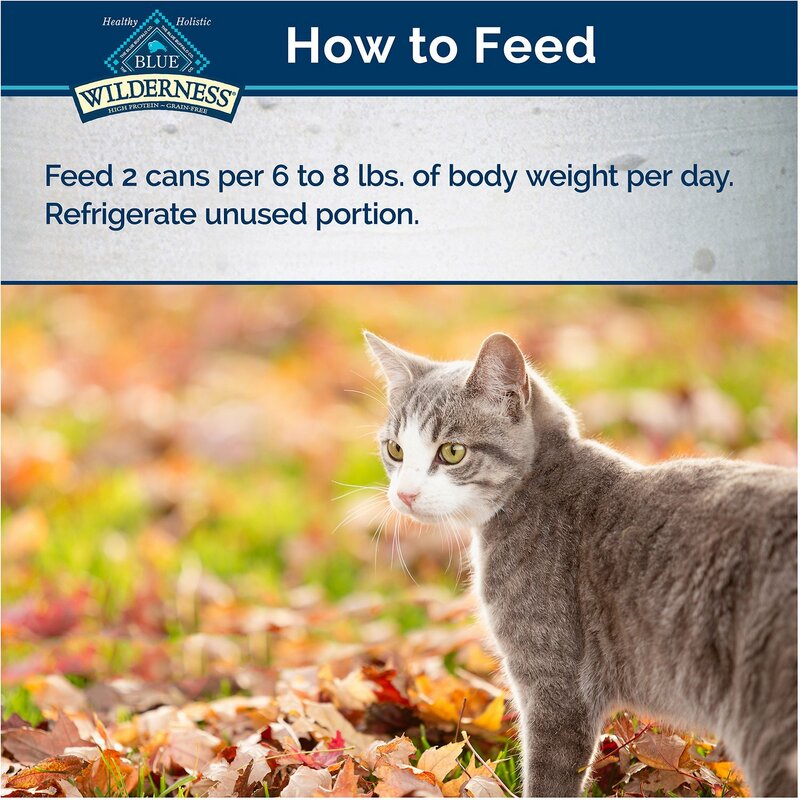 Feed 2 cans per 6 - 8 lbs of body weight per day. Miss Kitty is very finkey. Would pick at food or not eat and was getting sick on chicken wet food and dry food She is going on 2 years. 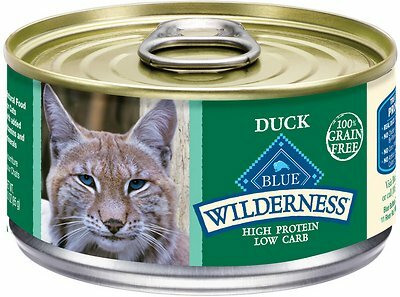 My vet recommended the duck.. She now meows for her food even before I take the can out. I use several types of blue buffalo and all and cars love their food. Good ingredients, not filled with potatoes, peas, carrots, blueberries, and other things cats don’t eat naturally. As a veterinarian, I feed a raw diet that I grind myself (bones and all) with the appropriate vitamins, taurine, organs, etc., and add a teaspoon of canned food for flavor variety. The boys get tired of chicken. My Savannah cats love this. Will definitely buy this again. 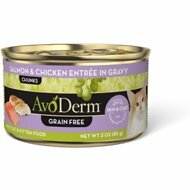 My adult male cat with a history of calcium oxalate bladder stones eats this happily, and with vet approval. It's a pretty dense pate, so I add some water to thin it and help with hydration. Bumper, my 18-year-old male cat, is notoriously finicky. When I gave him a dish of Blue Wilderness Duck, he scarfed it down without hesitation! The Blue Wilderness is not only grain free but they have many flavors for the picky cats. And ours are very picky. We have a 6 month old kitten and he goes through 3 cans daily. Our other 3 have to eat fast before he gets theirs. And every time I order from Chewy, my order is completed and shipped that day and most time received by the next day. You can't ask for better service than that. For the first time my cat is actually enjoying his food. He absolutely loves it. And I love that the first ingredient is meat not some filler. Chewy makes it so easy and is less expensive than what I paid in the store. In two days my order is at my door. It cannot get any easier. Its probably very good cat food, but my cat did not like it. I gave it to my sister in law and her cat did not like it. I know alot of cats are finicky and im sure it wasnt the food.